Winter is an excellent season to spend in Santa Fe. It’s the off-season for tourists, but the attractions, shopping and dining are still at their best! 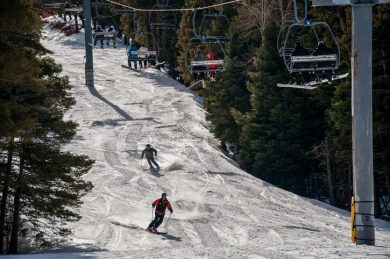 Although most people don’t think of New Mexico when they think of winter sports, the ski hills near Santa Fe are some of the most exciting around! Ski Santa Fe in particular has some great skiing terrain and is totally kid friendly. Anyone looking for things to do in Santa Fe with kids should definitely consider Ski Santa Fe. Whether you’re ready to spend the day outdoors or want to try out a romantic, world-class spa, we’ve got what you want right here in Santa Fe. Don’t forget to check out our incredible luxury Santa Fe vacation rental properties to make the most of your stay in this wonderful city! No matter what season, Canyon Road is a magical half-mile in Santa Fe that must be seen to be believed! Located in the Historic District of Santa Fe, this rustic, whimsical road is home to over one hundred world class art galleries, boutiques and some of our most popular restaurants. Whether you’re into the Southwest art scene, or you’re just out to enjoy a unique shopping and dining experience, you need to reserve a day for Canyon Road. Check out their Events Calendar for special events. The Santa Fe Plaza is the cultural hub of the city, always buzzing with activity. From restaurants to music concerts to Indian and Spanish markets, you’ll experience the liveliness of the city at the Plaza. Enjoy some of the city’s top attractions, located within the surround of the Plaza. They include the Cathedral Basilica of St. Francis of Assisi, the San Miguel Mission, and the Palace of the Governors. You can easily spend a day here enjoying the unique and old culture of Santa Fe. Ducking in from the cold and absorbing the atmosphere is why this is one of the best things to do in Santa Fe during the winter. Not too far off the Plaza, you’ll find the Museum of International Folk Art. This unusual museum primarily showcases Southwestern art, but it also contains thousands of objects from the daily life of all sorts of global cultures. People looking for things to do in Santa Fe with kids will love the large collection of toys, and everyone will find some quirky item to draw their interest. A trip to Santa Fe isn’t complete without a stop at the largest O’Keeffe collection in the world. This museum is also within easy walking distance off the Plaza. Enjoy the view of New Mexico from the eyes of one of America’s most beloved artists. You’ll also learn more about O’Keeffe’s life through a video screened at the museum. The glass-blowing artists at Liquid Light Glass draw tourists and patrons to their colorful wares. Visit the studio to view beautiful glass art, sculpture, vases, and more. The glass-blowing classes are one of our favorite things to do in Santa Fe with kids, especially with older children. Try a class to learn the craft yourself or shop for the perfect souvenir to represent your stay in Santa Fe. Even in the winter season, this Farmers Market sells locally-grown produce, flowers, local treats, and other delicious food. You can teach your kids about how local farmers still bring their crop to market. Don’t skip this special cultural market; it contains something for everyone! Pamper yourself with a visit to Ten Thousand Waves, a spa resort inspired by the great Japanese mountain hot spring resorts. There are fewer better things to do in Santa Fe in winter than to luxuriate in some hot springs. Find your serenity in the hot tubs, the gardens, or during a hot stone massage outside in the snow. You’ll be amazed at the refinement of this spa. Hungry? A list of things to do in Santa Fe wouldn’t be complete without a Southwestern dining experience. As you tour the city, you’ll come across many great options. We suggest trying Maria’s New Mexican Kitchen on Cordova Road. You’ll have the pleasant trouble of choosing from their very (very) long list of margaritas, and the food is great. Bring the kids! They’ll find something yummy to fill their stomachs, too. 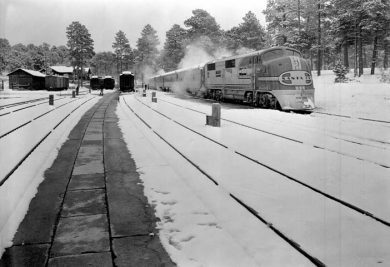 We hope you enjoy these nine great things to do in Santa Fe in winter. Our city has so much to offer all year round!